There are better ways to manage AWS than the AWS Management Console. 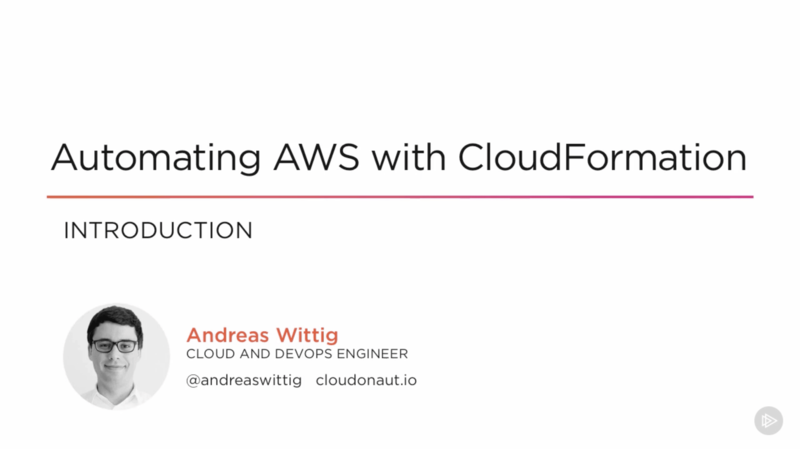 Join Andreas and Michael Wittig for their course: Automating AWS with CloudFormation. Michael and I have joined Pluralsight as authors for online training. I have worked on a course about Infrastructure as Code with CloudFormation during the last two months. I'm excited to announce that my first course was released: Automating AWS with CloudFormation. Amazon’s Cloud is 10 times bigger than its next 10 competitors combined. As an AWS customer, you benefit from a fast-growing and innovative platform. You probably started to manage your cloud infrastructure by clicking through the AWS Management Console. But managing growing AWS environments manually is complex and fault-prone. This course, Automating AWS with CloudFormation, will teach you the skills you need to automate your cloud infrastructure. First, you will learn how to describe your infrastructure in code, also called Infrastructure as Code. Next, you will dive into CloudFormation, which allows you to describe your infrastructure in a template, and finally, you'll bring it to life on AWS. When you're finished with this course, you will be able to automate your own cloud infrastructure with the help of CloudFormation, improving the quality of your infrastructure, saving costs by reducing manual work, and increasing the flexibility of your setup. Software required: text editor, SSH client, and AWS account. Watch the course overview now! Would you prefer to attend an AWS training in a classroom? tecRacer is an authorized training partner offering AWS training in Germany. Michael and I are teaching courses in Stuttgart. Book now! Note: All classes are held in German. I'm looking forward to your feedback! @andreaswittig or andreas@widdix.de.